Generally not sure if I'm being an idiot, but I can't find any information on modifying the appearance of guides (and grids). I happen to be working on a document that requires very specific alignment and the easiest way to to this is via the guides. I then hit a problem. My document uses the same blue as the guides, rendering them completely invisible. 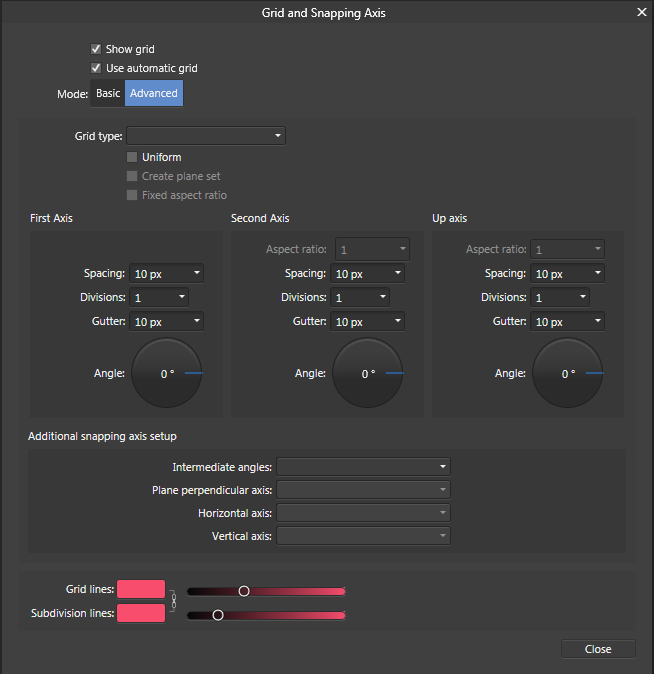 :rolleyes: I was wondering if it's possible to change the colour/thickness of guides and grids? I can obviously work around it, but figured I might be missing something. You didn't say Photo or Designer. In Photo go to View > Grid and Axis Manager and you get this if you click on "Advanced". You have loads of choices. I don't think you can change the guides. So I can't have pink guides too. Bummer ! Great, at least that clears it up for the grid colours and divisions. Pity about the guides though. I really wanted to change them to be IN YOUR FACE temporarily.